2010 Tour de France: Lance Armstrong, his RadioShack teammates, and team manager Johan Bruyneel ride on the Champs-Elysees during the post-stage parade of teams. - French sports daily L'Equipe Saturday is reporting that Lance Armstrong will arrive in France Monday to begin preparing for the Tour de France (July 3-25). While Armstrong was not expected to compete in the Dauphiné Libéré (June 6-13), L'Equipe reports that a source tells them the Tour de Suisse (June 12-20) is also unlikely. Armstrong is expected to begin training in and around his European base at Saint-Jean-Cap-Ferrat near Nice. - Team RadioShack manager, Johan Bruyneel, today announced the final roster for the 2010 squad - 26 riders from 16 different countries. - American Tyler Farrar (Garmin-Slipstream) won Stage 1 today of the Circuit Franco-Belge (to October 4). Stage 2 Tuesday starts in Maubeuge and finishes in Poperinge. The official website is here. Live ticker here. The October issue of Velo Magazine (French) just hit newsstands and the cover story is an interview with Lance Armstrong regarding his new team, RadioShack, and his plans for the 2010 season. In April, Armstrong may race some of the spring classics; "La Fleche Wallonne, Liege-Bastogne-Liege, we're not sure". Armstrong noted the May conflict between the Giro d'Italia (May 8-30) and the Tour of California (May 16-23, previously in February); "RadioShack is an American sponsor but the Giro is good preparation for the Tour de France." The Tour of California will already suffer from less world media exposure going head to head with the Giro; Armstrong racing the Giro would be a huge blow to the American race. Having previously commented that he would not repeat his 2009 pre-TDF preparation in the U.S., Armstrong told Velo Magazine that in 2010, "June will be more traditional, in Europe." (the Dauphine Libere (June 6-13) has been his favored pre-TDF race in the past but depending on what he does in May, the Tour of Switzerland (June 12-20) or even just training and reconnaissance may be more likely). 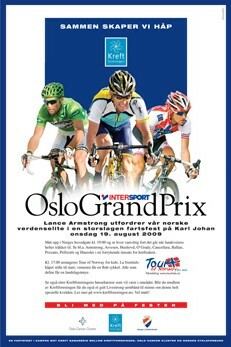 - Lance Armstrong in Oslo videos: Armstrong interviews/Hushovd victory at the 2009 Oslo Grand Prix. A Google-translated article here also has above interview videos embedded in story with photo from 1993 World Championships. Some videos require Microsoft Silverlight plug-in. Update: Oslo Grand Prix LIVE now. Links below. The Oslo Grand Prix is this evening and riders expected on the start line include 7-time Tour de France champion Lance Armstrong, Thor Hushovd, Kurt Asle Arvesen and Edvald Boasson Hagen. Run on a 1km long circuit in the Oslo city center, the race is scheduled to begin at 19:15 CET (1:15pm U.S. Eastern) and will run for 90 minutes. Lance Armstrong became World Champion in Oslo in 1993. Armstrong will be giving a lecture tomorrow on cancer awareness. Note: Some feeds will alternate between the Oslo Grand Prix and track and field worlds. Big thanks to Trygve of Norway for tipping us off about the race coverage. 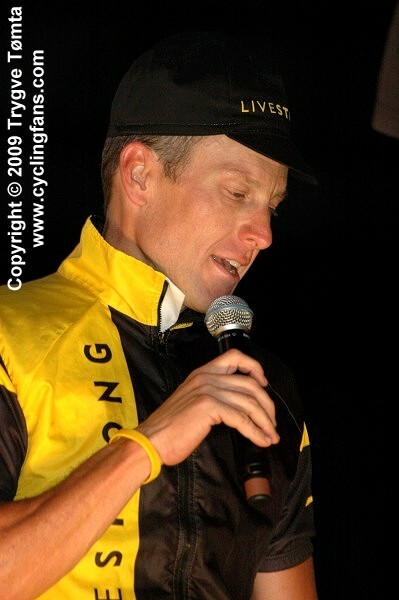 2009 Oslo Grand Prix: Lance Armstrong (Livestrong) speaks to the crowd. "Contador is alone, or nearly so, but he can't allow himself to admit it." - Tuesday's Tour de France Stage 10 departs Limoges at 12:30 CET (6:30am U.S. Eastern) and is expected in Issoudun between 16:59 and 17:25 CET (10:59am and 11:25am U.S. Eastern). Tour de France live coverage on Versus TV is scheduled to begin at 8:30am U.S. Eastern (8:00am U.S. Eastern for the Versus live streaming). Live coverage on Eurosport is scheduled to begin at 13:45 CET (7:45am U.S. Eastern). - Tour de France: Today is the first of two rest days. - Lance Armstrong was featured on the popular Vivement Dimanche program on France 2 television yesterday. Hosted by the highly respected Michel Drucker, the program includes guest commentary and questions from a number of celebrities including 5-time Tour champion Eddy Merckx, 2-time TDF champ Laurent Fignon, Eric Fottorino (writer and director of Le Monde), and French writer Christian Laborde (longtime Armstrong fan and author of the book "Champion" about Armstrong). Drucker recently travelled to Aspen, Colorado for the feature which includes highlights from Armstrong's career, accompanied by a variety of song clips from the Alan Parsons Project's Sirius (the music long used to introduce the Chicago Bulls players before home games) to John Denver's Rocky Mountain High. The program is a full hour long and you can watch it online here. (Armstrong mostly speaks in English, sometimes dubbed in French, sometimes with sub-titles.) Nicely done. Kristian House (Rapha Condor) wins in Abergavenny, Wales. Kristian House (Rapha Condor, first) and Daniel Lloyd (Cervelo Test Team, second) on the podium. 2009 Nevada City Classic: Lance Armstrong's last race before the Tour de France. AFLD/Armstrong: "No penalty, all samples clean." 7-time Tour de France champion Lance Armstrong has just reported via Twitter that he has heard from the French Anti-Doping Agency (AFLD) regarding the testing of blood, urine and hair samples he gave while in France in March. "Case closed, no penalty, all samples clean," wrote Armstrong.